Today: a very special traces of graphite post that has been in the making since April. I won’t introduce the artist – if you don’t recognise the name you will soon find out where you might have seen her work. Thank you very much for agreeing to answer these questions. Could you please introduce yourself and your work and tell us where people might have seen your work? Hi there. My name is Oriana Fenwick, I am a freelance illustrator from Zimbabwe currently living and working in Frankfurt am Main, Germany. My illustrations are done to 99% using pencil, sometimes I go wild and create the other 1% with colour pencils. I have mainly worked for magazines and newspapers in the past. My clients include Die Zeit, football magazine 11 Freunde, Air Canada, DWELL and publishing house Rowohlt. One recent project I was particularly happy to be involved in was the book “The Pencil Perfect” for Gestalten Books. How long does it take to draw an illustration of the size and complexity found in “The Pencil Perfect” and is there an illustration in this book that you are especially proud of? The time I need per illustration can vary immensely. The more simple drawings with straight forward lines and subtle contrasting I could complete in about two hours. The longest I needed for an illustration in this book was about two days. It gets especially tricky when I have to reproduce typo, taking into consideration all the other details that usually go along with that. I think there are two drawings I had most fun completing in “The Pencil Perfect” and of which I especially liked the outcome. 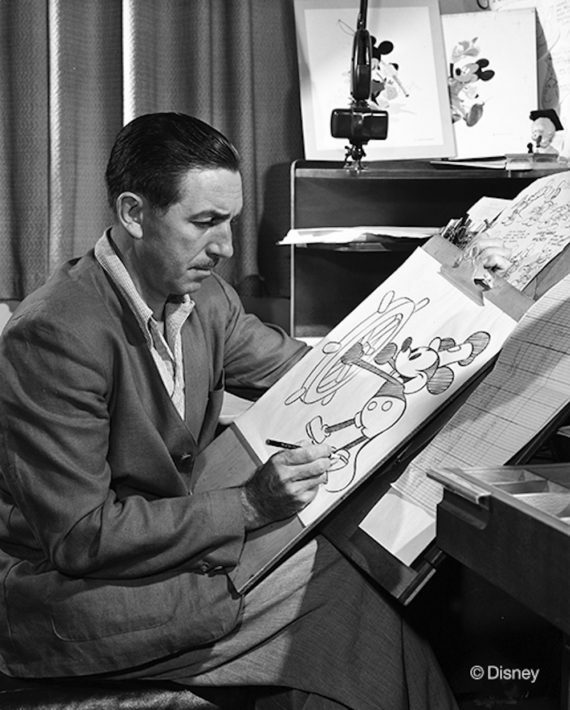 The one is of a series of pencil stubs and the other an image of Walt Disney drawing Mickey Mouse in his studio. 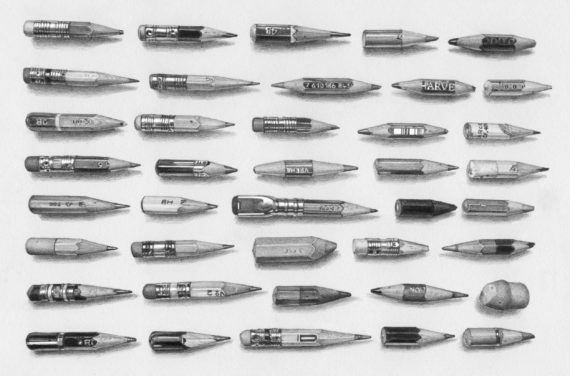 Are there specific techniques you use when drawing and are there any favourite tools / pencils you like to use? My drawing technique is pretty straightforward. I usually go about the main structure of the image using HB pencils, I never use anything harder than that. All of the shading and contrasting is then done afterwards using any grade as of 3B up to 6B. In order to get a surface to look especially smooth I criss-cross the lines until I can’t see the individual strokes anymore. My favourite brand is Faber-Castell1 – I seldom use anything else. And yes: I do rub out sometimes! If I know that the original drawing is going to be used then I tend to spray the picture after completing it. When I do drawings for digital purposes then I make sure to put them in protective covers once I’ve finished drawing, scanning etc, so I don’t necessarily spray them in that case. Thank you very much for taking the time to answer these questions and for giving us a glimpse into the world of a famous illustrator. I would like to thank Ms Fenwick for patiently answering my questions. You can find her web site at oriana-fenwick.com. If you are interested in similar blog posts have a look at the Traces of graphite category. As usual: please open the images in a new tab to see them in high resolution. If you are interested in a comparison: Below you will find the photo that was used as a basis for one of the illustrations in the Pencil Perfect book. 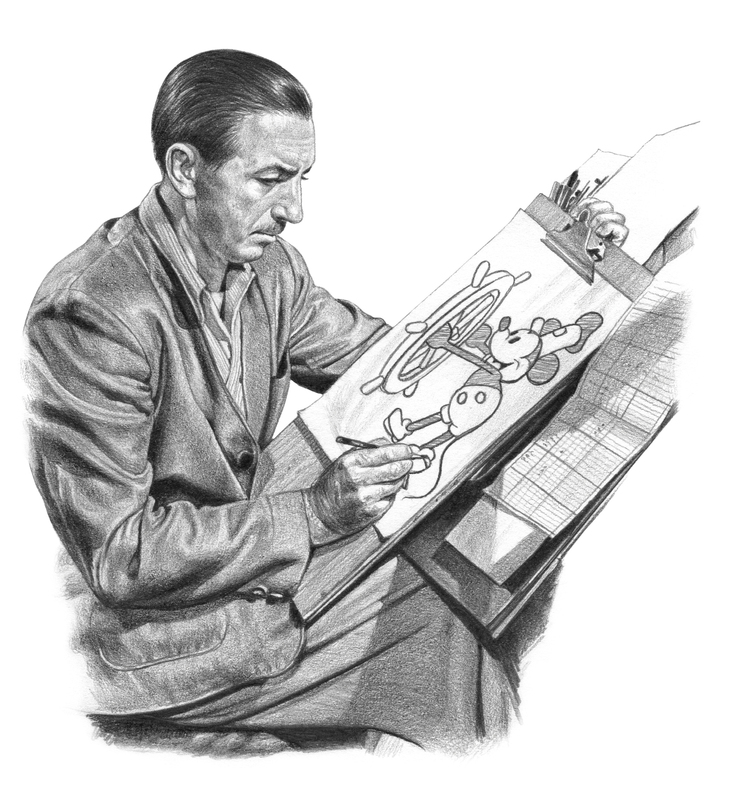 The photo of Walt Disney is used under the same conditions as the images in Duckipedia, as discussed with Egmon Ehapa.